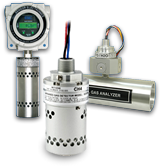 Process gas analyzers designed for non-extractive sampling. Single and dual channel devices for H2O, Hydrocarbons and Carbon Dioxide gas vapors. Infrared sensing technology. Capable of continuous monitoring for gas vapors. 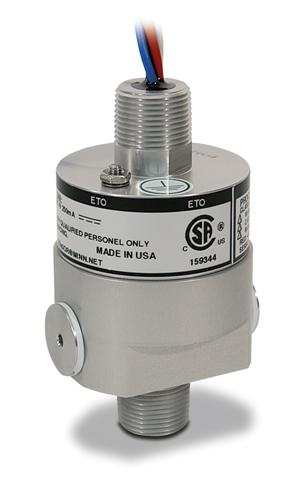 This optical gas detector is tuned to the infrared signature of the target gas or vapor. The process gas analyzers are tuned by measuring light at wavelengths absorbed by the target gas and at wavelengths not absorbed by the target gas. This toxic gas analyzer measure gas vapor density utilizing a patented self-compensation optical bench. Patented self-compensating optical bench. Explosion proof design wards off the harshest environments. The anodized aluminum surface of the optical chambers are heated to discourage condensation. The analog output of these devices can be connected to a chart recorder, data acquisition system or a process control system. No mirrors or reflecting surfaces are used in this device. Once the analyzers are spanned to a specific mid range gas concentration (a one time operation), routine calibration consists of only re-zeroing the device periodically.